This article was originally confined to the objectionable parallel trial by the media, of a case which may be the imminent or current subject matter of a trial before a Court of justice. Although the above objective has, by and large, been adhered to, certain supervening incidents persuaded the author to marginally digress from the bad effects which a trial by the media can cause to the administration of justice. The term “fourth estate” comes from the Reporter's gallery in the House of Commons of the British Parliament. The said expression is currently used to mean the journalistic profession and the news media. The origin of the term “fourth estate” is attributed to Edmund Burke, a British orator, writer and statesman born in Ireland in the year 1729. Burke is said to have used the term “fourth estate” in a parliamentary debate in 1787 on the opening of the press reporting of the House of Commons of Great Britain. The other three traditional estates of the British Parliament are the Lords spiritual, the Lord Temporal and Commons. The corresponding three estates of French States-General are the Church, the nobility and the townsmen (the commons). 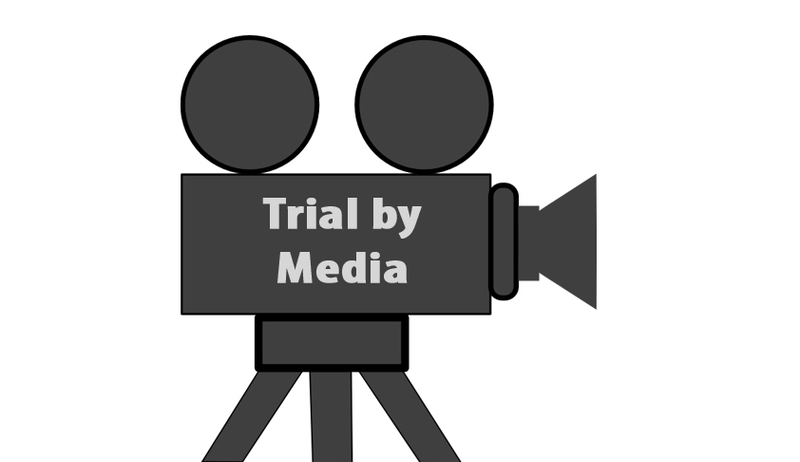 WHAT IS TRIAL BY MEDIA? “The impact of television and newspaper coverage on a person's reputation by creating a widespread perception of guilt regardless of any verdict in a court of law. During high publicity cases, the media are often accused of provoking an atmosphere of public hysteria akin to a lynch mob which not only makes a fair trial impossible but means that regardless of the result of the trial, in public perception the accused is already held guilty and would not be able to live the rest of their life without intense public scrutiny”. (Vide para 293 of R.K. Anand v. Delhi High Court -(2009) 8 SCC 106). “A trial by press, electronic media or public agitation is very antithesis of the rule of law. It can well lead to miscarriage of justice”. But when a sensational criminal case comes up for investigation before the police or for adjudication in a subsequent trial before the Court, the usual question asked is “Is the media expected to be a silent spectator insensitive to the happenings around and failing to quench the public curiosity about the case ?”. A Writ Petition filed before the High Court of Kerala requested the Court to handover the investigation of a land grab case involving the gunman (subsequently suspended) of the present Chief Minister of Kerala, to the CBI. The said request was allowed by a learned Single Judge who in his judgment (of avoidable prolixity running into 132 pages) inter alia, observed that when the allegation was against a member of the personal staff of the Chief Minister and when there were complaints against the State Police that they were shielding the culprits, it is a fit case for entrusting the investigation to the CBI. Accordingly, the Writ Petition was so ordered. As soon as the judgment was delivered, various television channels came out with “breaking news” to the effect that the High Court had made scathing strictures against the Chief Minister. Taking the cue from the media reports the opposition repeatedly used their broach against the Chief Minister alleging that he was shamelessly clinging to the Chief Minister's chair. The “news bomb” thus exploded by the media had its own devastating effect on the body politic. Parliament elections were round the corner. While the political rivals of the ruling party took full advantage of the “breaking news”, those in the ruling congress party started a vituperative tirade against the learned Judge by even attributing partisanship to him. Occasions when the Judge and certain leaders of the opposition were together in some public or social functions or on a boat ride etc. in the distant past were cited, out of context to allude that the Judge was hand-in-glove with the opposition in the invective ventures against the Chief Minister. A sitting MLA even went to the extent of sending an open letter to the Chief Justice of India indicating that the alleged misconduct on the part of the Judge was grave enough to impeach him. The situation became serious enough to force the Advocate General of the State to file an appeal before the Division Bench for expunging the alleged strictures in paragraph 71 of the judgment and the Division Bench stayed two sentences in that paragraph. Out of sheer curiosity I got down a copy of the condemned Judgment. It was shocking to note that except referring to various allegations levelled against the office of the Chief Minister by the Writ Petitioners and except alluding to the findings recorded by various Governmental agencies, there was no adverse or disparaging remarks personally made by the Judge against the Chief Minister. Even the references made were only to say that the matter called for an impartial investigation by the CBI . But the impact which the “media bomb” had already created and the consequent reaction by the politicians and other vested interests were such that the Advocate General presumably had no option except to move the Division Bench which in turn stayed two innocuous sentences (which if read along with the preceding and succeeding paragraphs do not have the attributed effect at all). One thing is very clear. It was without even reading the judgment that the “breaking news” was shot at the unsuspecting public in the most irresponsible manner. Kerala State soon witnessed the unprecedented scene of the wounded Judge making a public statement refuting the personal allegations made against him in the print and electronic media. When legally challenged personnel are at the helm of news reporting, what the viewing and reading public get is distorted, garbled, truncated and misleading versions. The injured do not sue those who are guilty of spreading slanders, libels and canards either because they have no time to do so or because they are not rich enough to fight the mighty media. But the trend is certainly pernicious, counter-productive and self-destructive. Inquisitive busy bodies shouldn't forget that they too have their own frailties, vulnerabilities and weaknesses which they loath if made public. The cruel pleasure of excoriating others will vanish when it comes to one's own turn to be on the receiving end. Howsoever high or low he may be, every person has his reputation which another including the media is not entitled to invade on the basis of unconfirmed or misinformed rumours. Judges who do not repudiate or contradict the personal denunciation levelled against them are very often the soft targets of their condemners. Freedom of the Press is thus a derivative of the citizen's fundamental right to freedom of speech and expression as enshrined in Article 19 (1) (a) of the Constitution of India. This means that the media does not enjoy any power larger than that of the general public whom they represent. In other words, the media is subject to all the restrictions which every member of the general public is subject to. In fact, the journalist is saddled with more responsibility since what he says or writes is likely to influence the public to a greater degree than what an ordinary citizen says or writes. c) the law of contempt of Court etc. “We do appreciate that in respect of some cases (largely criminal cases) the justice delivery system in our country progresses virtually at a snail's pace and often an innocent person has no real remedy available to him, if he in framed in a matter, or is subjected to a 'trial by media'. As a result, seldom does anyone approach a Court of law for relief either by way of an injunction or for damages in a case of 'trial by media'. Such being the reality, we are of the opinion that the Courts have a great responsibility and, therefore, need to be far more vigilant and pro-active in protecting the rights and reputation of an individual from an unwarranted 'trial by media'. In a sense, the Courts have to energize the rule of law. While this may add to the burden of our criminal Courts, we are of the view that it is imperative for the Courts to protect a citizen from what may appear to be victimization. This is certainly the duty if not an obligation of Courts. This is all the more important in a pending matter. For example, if a person is arrested on the suspicion of having committed a crime, it is not the function of the media to 'declare' him (by implication) innocent or guilty. That is within the exclusive domain of the judiciary. But if the accused is subjected to a 'trial', either through the print or audio-visual medium, it may subconsciously affect the judgment of the Judge, and that may well be to the prejudice of the accused, who is, in our justice delivery system, presumed innocent until proven guilty. In such a situation, the Judge must be pro-active by restraining the media from carrying out a parallel trial. Otherwise our criminal justice delivery system will be completely subverted. Failure to do so would result in an unfortunate situation arising in some cases as will be evident from what we discuss herein below”. Criminal law has a purpose to serve. Its object is to suppress criminal enterprise and punish the guilty. (Vide State of Kerala v. Narayanan Bhaskaran 3. It is through the medium of the criminal court and governed by the procedure laid down in the Cr.P.C. that the trial of persons charged with criminal offences, is being held. The law, flowing primarily from Article 21 of the Constitution of India, guarantees “fair trial”. A fair trial has two objects in view. It must be fair not only to the accused but also to the prosecution. The trial must be judged from this duel point of view . (See T.H. Hussain v. M.P. Modkakar 4). It is, therefore, necessary to remember that a Judge does not preside over a criminal trial merely to see that no innocent man is punished. A Judge also presides to see that a guilty man does not escape. One is as important as the other. Both are public duties which the Judge has to perform (See Krishnan v. Krishnaveni 5). A miscarriage of justice may arise from the acquittal of the guilty no less than from the conviction of the innocent. If unmerited acquittals become the general rule they tend to lead to a cynical disregard of the law (Vide Shivaji Sahebrao Bobade v. State of Maharashtra 6 Gangadhar Behera v. State of Orissa 7. A criminal trial is meant for doing justice to three entities, namely, the victim, the accused and the society at large. See Ambika Prasad v. State (Delhi Administration 8 ). Public interest demands that criminal justice is swift and sure, that the guilty is punished and the innocent is absolved in a fair and impartial trial while events are still fresh in the public mind (See M.S.Sheriff v. State of Madras 9 ). One of the cardinal principles which should always be kept in mind in our system of administration of justice in criminal cases is that a person arraigned as an accused is presumed to be innocent until proved guilty by the competent criminal court. Another golden thread which runs through the web of administration of justice in criminal cases is that if two views are possible on the evidence in the case -one pointing to the guilt of the accused and the other to his innocence, the view which is favourable to the accused is to be accepted. (See Nishar Ali v. State of U.P. 10 Kaliram v. State of Himachal Pradesh11 Sheo Nandan Paswan v. State of Bihar 12). The above proposition is founded on the principle that the benefit of doubt should always be extended to the accused and not to the prosecution. That is why in cases where Court has no concrete evidence before it to record a conviction against the accused and the Court only entertains a suspicion that the accused may be the culprit, the Court will not convict the accused but would give him the benefit of doubt. In such a case, it could also be said that the prosecution was not able to prove the guilt of the accused beyond reasonable doubt. In a criminal trial the burden to prove the case alleged against the accused, (except where there is a departure made in a given statute) is always on the prosecution and the judicially settled yardstick to discharge the said burden is by proof beyond reasonable doubt. But these are not the criteria adopted by the media. For the journalist, mere suspicion or hearsay evidence or alleged confession by the so called accused to the police (which is inadmissible in evidence except in cases covered by Section 162 (2) Cr.P.C.) are more than sufficient materials to bolster up a 'scoop' and serve it to the unsuspecting public as a “breaking news”. Such a stuff will not stand the scrutiny before a criminal Court. It is in this area that the media comes in conflict with the judiciary. While a free Press is indispensable for the smooth functioning of the democracy and courts are open to the public and, therefore, the administration of justice also should be open to public scrutiny which includes the freedom of the media as well to report court proceedings, such reporting can be made only subject to the restrictions imposed by the legal system. This will help the smooth functioning of the democracy and can thereby balance the power vested in each organs of the State and also the fourth estate in ensuring and upholding the rule of law. Where a judicial proceeding (including a trial) is imminent or pending before a court of justice, there is generally a prohibition against publication and discussion of the subject matter which is sub judice. “Sub judice” is a Latin expression which means “under a Judge” or “under judicial consideration“. The settled view in this connection as propounded in Government Pleader v. Mathayi Manjooran 13 C.G. Janardhanan v. T.K.G. Nair 14 Kochu Moideen v. Nambissan and Others 15 and other cases, has been that in criminal cases in order that a matter becomes “sub judice”, it is sufficient if a crime case has been registered, investigation started and proceedings in Court are imminent and that editing, printing or publishing of news in such manner as to cause prejudice affecting a fair trial amounts to contempt of court. But, some ambiguity has been introduced in the Explanation to Sec. 3 of the Contempt of Courts Act, 1971 with regard to the stage at which a matter can be considered to be “pending”. The said Explanation would state that in criminal proceedings under the Code of Criminal Procedure, 1899 or any other law in force (necessarily laws in force at the commencement of the Contempt of Courts Act, 1971) a criminal proceeding can be said to be pending only when the charge sheet is filed or when the Court issues summons or warrant or takes cognizance of the matter wherever applicable. This aspect has been discussed in the 200th Report of the Law Commission. The then Chief Justice of India Mr. Justice K.G. Balakrishnan in an Article on this subject and reported at page 1 of the Journal Section of (2010) 6 SCC has opined that some clarification may be necessary as to what the expression “pending” means. In my humble view the earlier position remains unaffected by the said Explanation. In the first place, taking a hyper-technical view, it could be said that the present investigation is not under the Code of Criminal Procedure, 1899 but under the Code of Criminal Procedure, 1973. Secondly, the concept of fair trial is not confined to trial before the Court. It encompasses the stage of investigation as well so as to include fair and speedy investigation within the ambit of fair trial. Any different interpretation can lead to disastrous consequences. Supposing a case is still in the crime stage (i.e. under investigation) then will it be open to the media to take shelter under the Explanation referred to above and escape an action for contempt of court on the ground that there was no case “pending” before Court when the offending report was made and, therefore, the offending report (which is otherwise derogatory to the parties and the concept of fair trial and which has a tendency to interfere with the due course of justice causing prejudice in public mind) does not constitute contempt of Court ? In my opinion, it will be no defence for the publisher of an offending report to contend that whatever he did was at the investigation stage and not at a stage when the case was pending before Court. To my limited knowledge this aspect of the matter has not yet come up for resolution on the judicial side of the Apex Court. As the press is a primary instrument in the creation of public opinion journalists should regard their calling as a trust and be ready and willing to serve and guard the public interest. In the discharge of their duties, journalists shall attach due value to fundamental, human and social rights and shall hold good faith and fair play in news reports and comments as essential professional obligations. Freedom in the honest collection and publication of news and facts and the right of fair comment and criticism are principles which every journalist should always defend. Journalists shall observe due restraint in reports and comments which are likely to aggravate tensions likely to lead to violence. Journalists shall endeavour to ensure that information is factually accurate. No fact shall be distorted and no essential facts shall be suppressed. No information known to be false or not believed to be true shall be published. Responsibility shall be assumed for all information and comment published; if responsibility is disclaimed, this shall be explicitly stated before hand. Unconfirmed news shall be identified and treated as such. Confidence shall always be respected and professional secrecy preserved but it shall not be regarded as a breach of the Code if the source of information is disclosed in matters coming up before the Press Council or courts of law. Journalist shall not allow personal interest to influence professional conduct. Any report found to be inaccurate and any comment based on inaccurate reports shall be voluntarily rectified. It shall be obligatory to give fair publicity to a correction or contradiction when a report published is false or inaccurate in material particulars. All persons engaged in the gathering, transmission and dissemination of news and comments thereon shall seek to maintain public confidence in the integrity and dignity of their profession. They shall assign and accept only such tasks as are compatible with this integrity and dignity; and they shall guard against exploitation of their status. There is nothing so unworthy as the acceptance or demand of a bribe or inducement for the exercise by a journalist of his power to give or deny publicity to news or comment. The carrying on of personal controversies in the press, where no public issue is involved, is unjournalistic and derogatory to the dignity of the profession. 14. It is unprofessional to give currency in the press to rumour or gossip affecting the private life of individuals. Even verifiable news affecting individual shall not be published unless public interests demand its publication. 15. Calumny and unfounded accusations are serious professional offences. 16. Plagiarism is also a serious professional offence. 17. In obtaining news or pictures, reporters and press photographers shall do nothing that will cause pain or humiliation to innocent, bereaved or otherwise distressed persons. A. The Kerala solar case: People, particularly the Malayalam speaking population the world over had been watching the media highlights of a Kerala case popularly called the “Solar Case”. The contents of documents and other evidence were discussed in public knowing fully well that a trial before the criminal court involving those material was imminent. Witnesses either for or against in proof or disproof of certain issues in that case were appearing in the media and questions were freely asked. Dubbing the suspects in that case as the real culprits and indulging in ridiculing, mocking at or caricaturing them as persons without character or reputation, were also resorted to forgetting that they enjoy the presumption of innocence until found guilty by a competent court and that too after a full-fledged trial. Their photographs were recklessly taken and published. Persons accused of offences also enjoy all the fundamental rights including right to privacy. When the statements made by witnesses before the Solar Scam Commission of Inquiry and even the future report of the Commission cannot be made use of in the trial before the criminal Court, the media has been indulging in holding interviews with the witnesses who testified before the Commission and the contents of their alleged testimony before the Commission, were freely published and the mind of the public has been polluted even to the extent of influencing their right to vote in the forthcoming Assembly elections. 8. Media engaged in snatching investigation details: Instances of inducing, tempting, bribing or blackmailing investigating police officers or other officers (in-charge of investigation of offences) or members of their team, with a view to elicit, steal or extract the materials collected during investigation and discussing the same in public after giving the same the appropriate colour to suit the reporter or his boss and sell a one-sided story, are allegations which are frequently levelled against media persons. There are judicial verdicts to be referred to at a later stage forbading such investigating officers and their team members from leaking out information regarding the investigation of a case during the crime stage. Those prohibitions are more honoured in their breach than observance by some police officers for considerations which are certainly not genuine. C. The mighty and all pervading media:- The media now-a-day's have such wider range, wider sweep and wider coverage that a wrong, misleading or false report about a person or institution can cause incalculable harm to the aggrieved. It is no solace to declare that the wronged will be compensated by money and a corrigendum expressing apology for the wrong news will be issued. The person or institution whose image is tarnished may not be in a position to fight the mighty media and get adequate recompense even assuming that the same will put him or it in the former position. This is equally applicable to courts and other adjudicatory bodies. No person can be condemned unheard. Before making disparaging remarks about the conduct of a witness or a functionary in the administration of justice, the Forum is bound to hear him and elicit his explanation for such conduct. When all other democratic institutions are bound by the rules of natural justice, the media cannot claim any immunity from such rules. E. Audi alteram partem : Whether it is the media or any other person criticising another, behind his back, for an act should realise that there is always another view for the alleged act and whatever sensation is made through publishing the one-sided story without adequate and serious enquiry, will be short lived. These are instances of misreporting or irresponsible reporting. It was without actually watching the Court proceedings which lasted for several days and it was without having the proper grip of the case under trial before this Court that the Advocate participant in the above programme was airing his views on the propriety of the Court asking questions to a witness. This Advocate (who according to Mr. Sreekumar is a CPI (M) co-passenger) was also seen defending the respondent. There is the unfortunate emergence of a trend among people to become more and more clannish when a member of their own fold commits a mistake. Instead of admitting the mistake and correcting him and imposing adequate punishment including expulsion from the association if the degree of delinquency is grave enough, other members with a trade-union zeal defend such erring persons tooth and nail. This is a pernicious trend. It is not known as to whether the Advocate was consulted as a political personality or a 'jurist'. Such opinionated critics with perfunctory grasp of pending proceedings pose real threat to the administration of justice. The Judges here do not require any unsolicited advice from such persons on the "dos and don'ts" in justicing. There are better stuff, both in the legal profession and in the larger fraternity of law to be consulted, if need be, for Judges who are in doubt or distress. If the media participation by the Advocate is a veiled threat to Courts trying cases involving persons belonging to a particular political party, let him and likeminded persons bear in mind that they have no business either to offer their comments on matters which are sub judice or professedly lay down any code of conduct for Judges while engaged in the solemn duty of dispensing justice. The laws, including the statute and interpreted laws, of this country are adequately vibrant to take care of such situations in Court. We Judges do concede that we are not infallible. But, if we Judges of the High Court go wrong there is the Supreme Court to correct us. In the above case Sri.M.V. Jayarajan, a politician belonging to the Marxist Communist Party was found guilty of contempt of Court by the High Court which, however, refused to exercise the discretion under Section 19(3) of the Contempt of Courts Act, 1971 to suspend the execution of the sentence of imprisonment passed against Sri. M.V. Jayarajan. He had, therefore, preferred an appeal before the Supreme Court challenging the conviction recorded and sentence passed against him. A senior Advocate of the Kerala High Court appearing in a television channel found fault with the High Court in not invoking the mandatory provision under Section 389 (3) Cr.P.C. and suspending the execution of sentence automatically. A casual examination of the provisions of the Contempt of Courts Act would have revealed that in view of Section 19 (3) of that Act, Sec. 389 (3) Cr.P.C. has no application. Similarly, the very same Senior Advocate criticised the High court for engaging a lawyer for the High Court in the appeal preferred by Sri.M.V. Jayarajan and remarked that in a case in which the High Court was not even a party, it was highly improper for the High Court to have engaged a counsel. The above criticism was also made without verifying whether the High Court was a respondent in the appeal preferred by Sri. M.V. Jayarajan. As a matter of fact, in the appeal preferred by Sri. M.V. Jayarajan before the Supreme Court, the High Court of Kerala was the sole respondent and it was on the submission made by the counsel engaged by the High Court that the State of Kerala was impleaded as an additional respondent in the appeal. (2) The role expected of a lawyer and the duties of the Bar Councils:- The propriety of media participation by Advocates and the duties cast on the Bar Councils were succinctly stated by the Supreme Court in R.K.Anand v. Delhi High Court 17 . “331. The other important issue thrown up by this case and that causes us both grave concern and dismay is the decline of ethical and professional standards among lawyers. The conduct of the two appellants (one convicted of committing criminal contempt of court and the other found guilty of misconduct as Special Public Prosecutor), both of them lawyers of long standing, and designated Senior Advocates, should not be seen in isolation. The bitter truth is that the facts of the case are manifestation of the general erosion of the professional values among lawyers at all levels. We find today lawyers indulging in practices that would have appalled their predecessors in the profession barely two or three decades ago. Leaving aside the many kinds of unethical practices indulged in by a section of lawyers we find that even some highly successful lawyers seem to live by their own rules of conduct. 3 We have viewed with disbelief Senior Advocates freely taking part in TV debates or giving interviews to a TV reporter/anchor of the show on issues that are directly the subject-matter of cases pending before the court and in which they are appearing for one of the sides or taking up the brief of one of the sides soon after the TV show. Such conduct reminds us of the fictional barrister, Rumpole, “the Old Hack of Bailey”, who self-deprecatingly described himself as an “old taxi plying for hire”. He at least was not bereft of professional values. We express our concern on the falling professional norms among the lawyers with considerable pain because we strongly feel that unless the trend is immediately arrested and reversed, it will have very deleterious consequences for the administration of justice in the country. No judicial system in a democratic society can work satisfactorily unless it is supported by a Bar that enjoys the unqualified trust and confidence of the people, that shares the aspirations, hopes and the ideals of the people and whose members are monetarily accessible and affordable to the people. We are glad to note that Mr Gopal Subramanium, the amicus fully shared our concern and realised the gravity of the issue. In course of his submissions he eloquently addressed us on the elevated position enjoyed by a lawyer in our system of justice and the responsibilities cast upon him in consequence. His written submissions begin with this issue and he quotes extensively from the address of Shri M.C. Setalvad at the Diamond Jubilee Celebrations of the Bangalore Bar Association, 1961, and from the decisions of this Court in Pritam Pal v. High Court of M.P. (observations of Ratnavel Pandian, J.) and Sanjiv Datta, In Re (1995) 3 SCC619 (observations of Sawant, J. at pp. 634-35, para 20). We respectfully endorse the views and sentiments expressed by Mr M.C. Setalvad, Pandian, J. and Sawant, J. Here we must also observe that the Bar Council of India and the Bar Councils of the different States cannot escape their responsibility in this regard. Indeed the Bar Council(s) have very positively taken up a number of important issues concerning the administration of justice in the country. It has consistently fought to safeguard the interests of lawyers and it has done a lot of good work for their welfare. But on the issue of maintaining high professional standards and enforcing discipline among lawyers its performance hardly matches its achievements in other areas. It has not shown much concern even to see that lawyers should observe the statutory norms prescribed by the Council itself. We hope and trust that the Council will at least now sit up and pay proper attention to the restoration of the high professional standards among lawyers worthy of their position in the judicial system and in the society”. Before laying down the records of the case we must also advert to another issue of great importance that causes grave concern to this Court. At the root of this odious affair is the way the BMW trial was allowed to be constantly interfered with till it almost became directionless. We have noted Kulkarni’s conduct in course of investigation and at the commencement of the trial; the fight that broke out in the court premises between some policemen and a section of lawyers over his control and custody; the manner in which Hari Shankar Yadav, a key prosecution witness turned hostile in court; the curious way in which Manoj Malik, another key witness for the prosecution appeared before the court and overriding the prosecution’s protest, was allowed to depose only to resile from his earlier statement. All this and several other similar developments calculated to derail the trial would not have escaped the notice of the Chief Justice or the Judges of the Court. But there is nothing to show that the High Court, as an institution, as a body took any step to thwart the nefarious activities aimed at undermining the trial and to ensure that it proceeded on the proper course. As a result, everyone seemed to feel free to try to subvert the trial in any way they pleased. We must add here that this indifferent and passive attitude is not confined to the BMW trial or to the Delhi High Court alone. It is shared in greater or lesser degrees by many other High Courts. From experience in Bihar, the author of these lines can say that every now and then one would come across reports of investigation deliberately botched up or of the trial being hijacked by some powerful and influential accused, either by buying over or intimidating witnesses or by creating insurmountable impediments for the trial court and not allowing the trial to proceed. But unfortunately the reports would seldom, if ever, be taken note of by the collective consciousness of the Court. The High Court would continue to carry on its business as if everything under it was proceeding normally and smoothly. The trial would fail because it was not protected from external interferences. Every trial that fails due to external interference is a tragedy for the victim(s) of the crime. More importantly, every frustrated trial defies and mocks the society based on the rule of law. Every subverted trial leaves a scar on the criminal justice system. Repeated scars make the system unrecognisable and it then loses the trust and confidence of the people. Every failed trial is also, in a manner of speaking, a negative comment on the State’s High Court that is entrusted with the responsibility of superintendence, supervision and control of the lower courts. It is, therefore, high time for the High Courts to assume a more proactive role in such matters. A step in time by the High Court can save a criminal case from going astray. An enquiry from the High Court Registry to the quarters concerned would send the message that the High Court is watching; it means business and it will not tolerate any nonsense. Even this much would help a great deal in insulating a criminal case from outside interferences. In very few cases where more positive intervention is called for, if the matter is at the stage of investigation the High Court may call for status report and progress reports from police headquarter or the Superintendent of Police concerned. That alone would provide sufficient stimulation and pressure for a fair investigation of the case. In rare cases if the High Court is not satisfied by the status/progress reports it may even consider taking up the matter on the judicial side. Once the case reaches the stage of trial the High Court obviously has far wider powers. It can assign the trial to some judicial officer who has made a reputation for independence and integrity. It may fix the venue of the trial at a proper place where the scope for any external interference may be eliminated or minimised. It can give effective directions for protection of witnesses and victims and their families. It can ensure a speedy conclusion of the trial by directing the trial court to take up the matter on a day-to-day basis. The High Court has got ample powers for all this both on the judicial and administrative sides. Article 227 of the Constitution of India that gives the High Court the authority of superintendence over the subordinate courts has great dynamism and now is the time to add to it another dimension for monitoring and protection of criminal trials. Similarly, Article 235 of the Constitution that vests the High Court with the power of control over subordinate courts should also include a positive element. It should not be confined only to posting, transfer and promotion of the officers of the subordinate judiciary. The power of control should also be exercised to protect them from external interference that may sometimes appear overpowering to them and to support them to discharge their duties fearlessly”. Instances are not rare when some oral observations or queries by Judges or some oral submissions made by lawyers in a lighter vein are reported and unnecessary controversies are generated over such oral observations or queries or submissions. Very often, in the surcharged or monotonous Court proceedings tension is relieved or eased by an Advocate cracking a joke or the Judge making a comment. These are not happenings to be reported by the media out of context or for any bigot or self-proclaimed jurist to criticise the Judge or the Advocate. There could even be expression of tentative opinion by the Judge who may in the course of argument change his opinion as well. It usually happens that when the counsel for one side argues his case the Judge may, with a view to generate full discussion or unravel the minute niceties of law, intervene and highlight certain points which may apparently be favourable to the opposite side. Such intervention or expression of opinion cannot be and should not be misinterpreted as orders of the Court. There are some lawyers who will spring into forensic precision and focus only when jocularly heckled or snubbed from the Bench. Such judicial interjections should not be taken as hostile fulminations from the Bench. Reporting of such transient events happening in courts will certainly bring the judicial institutions into disrepute. The philosophy and psychology of the curial mechanics cannot be imbibed by a deviant Press Reporter whose cruel passion may be to forge a sensation out of everything to please his masters. It is pertinent to remember that the only functionary in a proceedings before Court who can ask even irrelevant questions is the presiding Judge and he has the statutory freedom to do so under Section 165 of the Indian Evidence Act, 1872. But it is mischievous to report every such oral dialogue in Court and spark off avoidable controversies therefrom for the vested interests including some unethical politicians to take advantage of the situation. Since it is neither desirable nor legal for a Judge to pass oral orders or issue oral directions, it is pernicious for the media to come out with misleading reports that a particular Judge who made an oral observation in court is a prejudiced Judge or has pre-judged the issue. Otherwise, a Judge who frames a charge against the accused or who declines bail to the accused or who refuses interim injunction to the plaintiff or the defendant, will have to be branded as a biased Judge and disqualified to proceed with the trial of the case. The way some of the media channels take the liberty of directly calling personalities holding responsible positions in the society, both past and present, and seeking their explanation for the alleged acts or omissions, shows the undesirable, if not pernicious tendency of encroaching into the right to silence of an individual who is answerable only to persons in authority. Under the guise of dissipating information to the viewers, such channels cannot arrogate to themselves the role of persons in authority. Questions are asked by media persons as if in a trial before an adjudicating forum and the answers or reticence commented upon characterizing the person "interrogated" either as a liar or an undependable person. Such character assassination is nothing but veiled slander. Friends, Indians, countrymen (who include the President, Governors, Ministers, Judges, Advocates, Bureaucrats, Politicians, Policemen, Public men and the Common man), you have no obligation to answer questions from the media unless you are itching for publicity and thereby you unwittingly want to play into their hands. Such media interventions are as good as, or as bad as, any busy-body prying into your privacy. If you start responding to their questions and make statements, then it may eventually become your responsibility to answer a volley of further questions with the inherent risk of the likelihood of your statements being misquoted, misinterpreted, distorted or even misused. The danger of your statement (made on the spur of the moment without any serious thought) being taken advantage of in any subsequent judicial proceedings, also cannot be ruled out. While the media has undoubtedly the right to bring to public focus crimes, atrocities etc, their role should end there. There are authorities and forums to go into the "how and why" and "who" behind such social evils. If truth is suspected to be a casualty before such authorities, well, the ever expanding "locus standi" jurisdiction enables the media also to give evidence before such authorities to ensure that justice is done. It has become a passion for certain media channels to select a few nascent Court verdicts for discussion under the garb of a public interest. The panelists including Advocates are selectively chosen to match with the ideology or proprietary interests of the media. Court verdicts are then subjected to a "post-mortem" examination in the course of which the political concern or the bias of the vested interests are allowed to be given vent to. In this process partisanship is very often attributed to the Judges whose verdict are assailed. It is a matter of shame that certain members of the legal profession, without adequate study or research, take this as an opportunity to settle their scores with the Judges or the litigating parties. The unfortunate net result is that half baked, misleading and garbled versions are slapped on the unsuspecting public (the viewers) engendering a negative bias against one party or the other. Very often the Government or its agencies are the targets of these media exploits. A COUPLE OF OTHER NOTABLE JUDICIAL PRONOUNCEMENTS DEPRECATING TRIAL BY MEDIA.